You can export results of any report in PDF, CSV, and XLSX (Excel spreadsheet), and then send the export to your accountant/payroll, keep as a personal backup, or import data into a spreadsheet and analyze the results. Only the data that’s in the report will be exported. So if you have filters applied, export will only contain filtered data. Grouping options in Summary report will affect how your exports look like. So for example, if you group by User and subgroup by Time entry, data will be grouped that way in the export also. Export of Summary report doesn’t contain timestamps. If you need timestamps, you should export Detailed report. If you want a full export all time entries, you can go to Detailed report, choose the longest date range, and export the results. The file will include all the time entries and their details (except billability status, tags, and client). 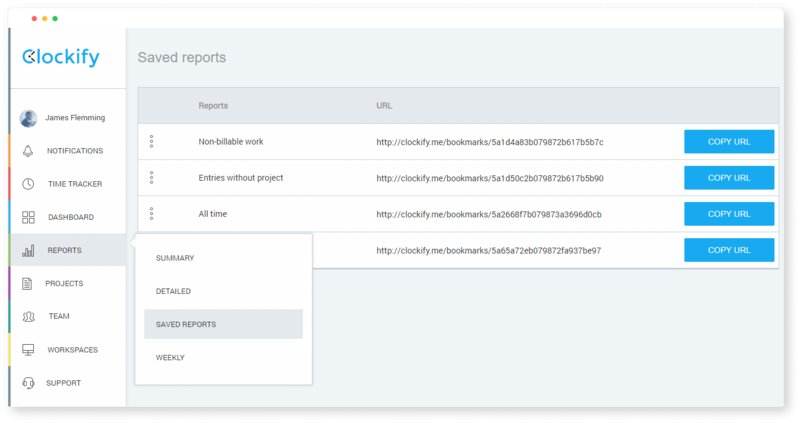 Saving reports is useful when you set the same types of filters and run the same types of reports over and over. Once you save a report, you can generate it in one click whenever you need to. Open a new tab and paste the URL to see the report containing the latest data. To change name or visibility of a saved report, click three dots icon next to the saved report and choose Update. To delete a saved report, click three dots icon next to the saved report, choose Delete, and confirm. Only the creator of the report and admins can delete a saved report. When you delete a saved report, the link will become inactive and show a blank page when opened. Be careful with saved reports. They contain all the information you’ve filtered, including earnings for all filtered time entries. Anyone can save reports. Only creators and admins can delete them. A saved report that is set as visible only to a certain user group can be accessed by only people who belong to that group and are logged in into Clockify. If you set “Who can see billable rates” to Everyone in workspace settings, everyone will be able to see earnings in a report. Otherwise, only admins will be able to see earnings. Exports of Detailed reports don’t contain earnings. Exports of Summary reports contain earnings if “Who can see billable rates” is set to Everyone; otherwise only exports made by admins contain earnings information. If you want to see rounded earnings (without decimal points), click the cog icon next to the print icon, and set rounding to “yes”.